There was an article on Cracked.com a few days ago about bizarrely specific things that every sci-fi show and movie does. When I got to the section on "All aliens eat bugs" they had a pretty amusing comment about B5. Figured it was worth sharing since it made me chuckle. 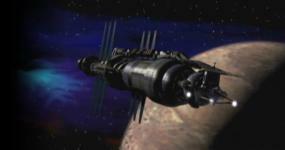 They also pointed out a few other tropes that B5 often fell foul of but the one that made me wonder was the last one. Did B5 also use Eurostile? Yes that "Cracked" me up. But seriously, that is great. I love it when we're made more relevant, even if it is through humor. As long as it doesn't mock the show in a manner that would make people not want to watch it, ie calling it a DS9 ripoff or some other mis-information, I am fine with humor keeping B5 in the world discussion. Any publicity like that is good publicity. Plus, fan or not, it is pretty funny. . . . "Spoo". And I always go back to The Big Bang Theory and how they COULD have made a Babylon 5 revival happen if they had just mentioned B5 more often. Anyway, some people think The Big Bang Theory is mocking Babylon 5 when the show is mentioned, but I disagree. The focal point of 80% of the humor in that show is Dr. Sheldon Cooper being the furthest character outside what many consider "normal" in our society. So when he mocks his friends for being fans of Babylon 5 it only means that people should give B5 a chance. The three friends lean more closely to what society would deem "normal" and therefore those viewers whom consider themselves fitting in the box of what they think is that "normal" state should be more interested in what the three friends like and turn toward what Dr. Sheldon Cooper says is bad. They couldn't have picked Star Trek for him to dislike so they had to pick a show which would be seen as good but divisive amongst sci-fi fans. A show that lots of people can argue is good but which a lot of people dislike. That pretty much singles out B5 as the best contender. I mean, how often do you meet sci-fi fans who think B5 is only OK. Either we loved the show or we didn't keep watching it. That is a very good point. At least here, I think in England B5 had more of a normal following than it did here in the USA.